IT'S A BIRD, IT'S A PLANE........NO......IT'S RAIFORD! 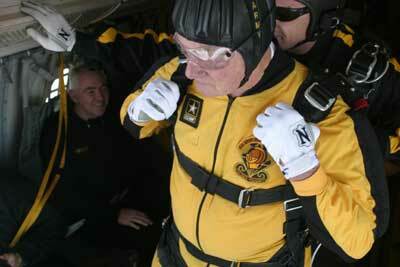 This year Bob Raiford plans to solve any airport/drive hassles, by parachuting in. 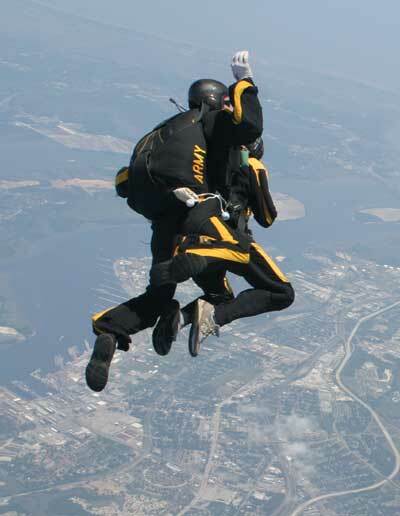 He made some practice jumps a few weeks ago with the Army's Golden Knights. Now, actually, Raiford DIDN'T tell me, in so many words, that he was going to parachute into Thurmont this year, BUT.........your webmaster simply put 2 and 2 together......(connected the dots...if you prefer) and came to the conclusion that.....WHY ELSE WOULD HE BE GOING TO ALL THIS TROUBLE? It must mean be that he plans to arrive ...by parachute!